CASC strive to provide a wide range of useful and innovative materials for those with an interest in clinical audit. Over the years we have developed many resources that highlight the importance of clinical audit and the valuable role it can play in improving the quality and safety of patient care. This section of the website gives visitors access to many resources that are entirely free. However, if you do use any of our resources we kindly request that you acknowledge CASC and you must not remove our logo and branding. We will update this section of the website periodically. If you have any requests for particular materials that you think would be helpful, then please get in touch if your audit will be a success. 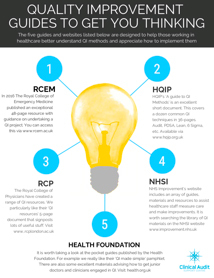 The following resources all relate to various elements of the clinical audit process or focus on the benefits of undertaking clinical audit. In this section you will find a range of different materials, from advice on how to determine your clinical audit sample, to how to be a change agent, from the key ingredients of an action plan, to a simple four-step evaluation to determine if your clinical audit idea will result in a successful project. Will my clinical audit work? As part of the work that we undertake we regularly come across useful documents, websites and resources that help in conducting clinical audit and wider quality improvement work. The section below provides infographics highlighting a number of materials that we find particularly useful. The website contains lots of materials and resources so please take a look. For example, you will find all our teaching materials for clinical audit here, examples of high quality audits carried out by junior doctors here and materials that support the annual clinical audit awareness week here.